I have always been fascinated by local history and as a child I would take great delight in discovering old photographs and history of places I knew well in the present time. This fascination has continued as I got older and now with the internet it is so much easier to find old photos and information. 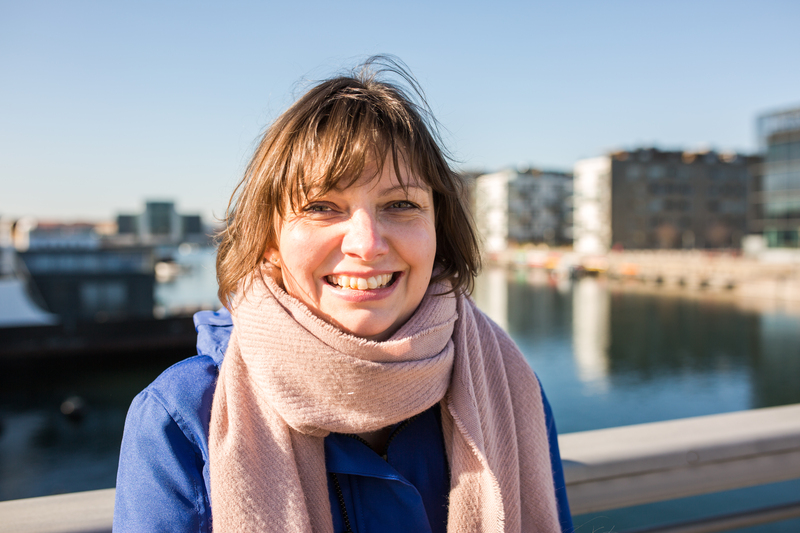 When we moved to Strandboulevarden in the summer, I immediately noticed a magnificent building with a sparkly green tiled roof on the corner of Østerbrogade and Strandboulevarden. 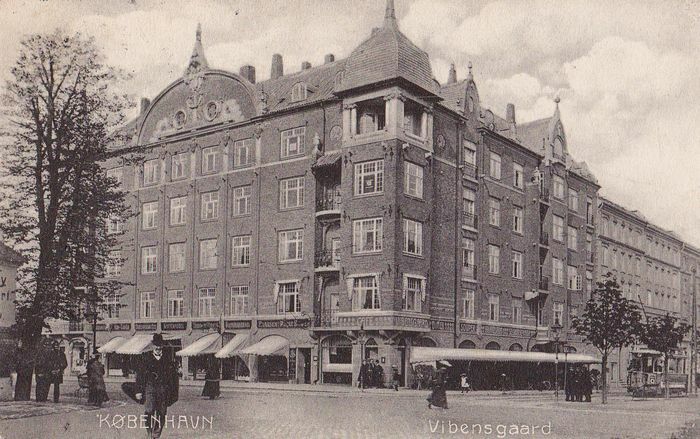 I knew it must have a history and looking up at its facade I saw its name – Vibensgård. 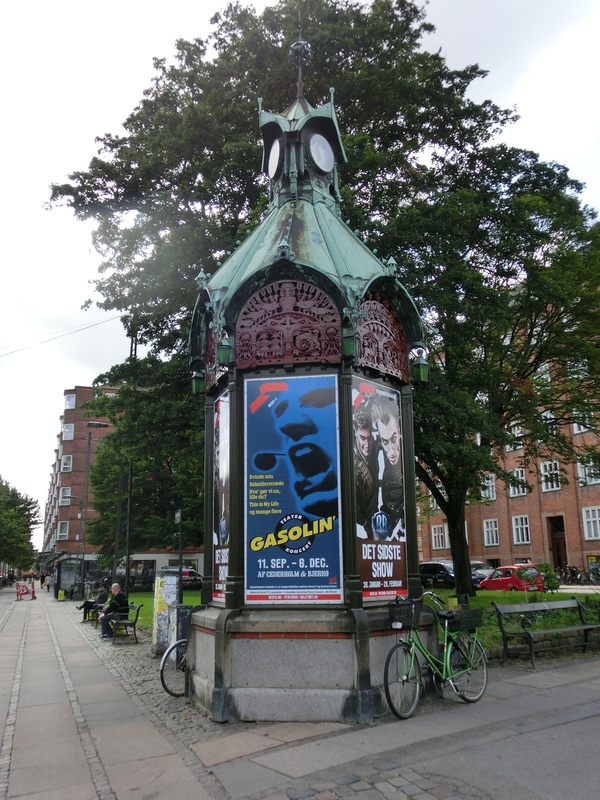 The opposite side of the road was another fabulous building – Lille Vibenshus and a strange little circular booth on the third corner on Poul Henningsens Plads. I felt I had to find out more about these places. I was surprised the find that much of this area was potato fields up until the end of the 19th Century and early 20th century. 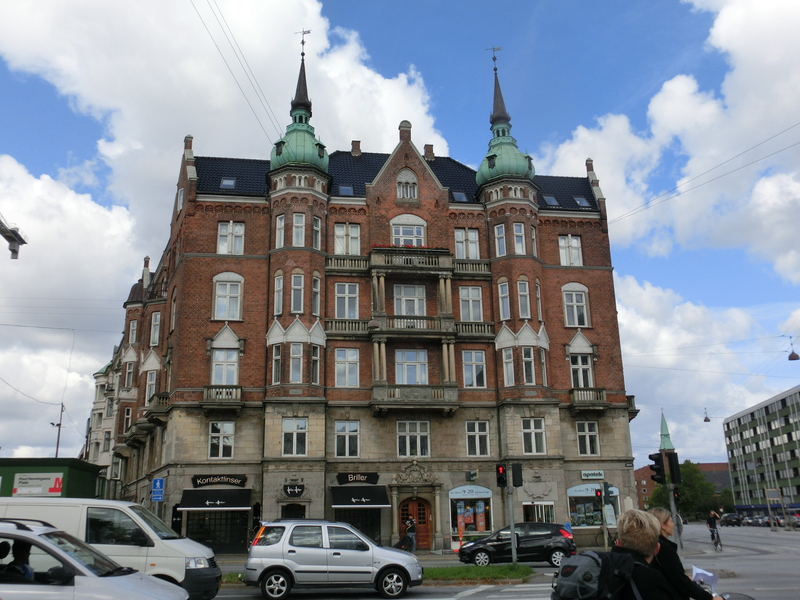 Vibensgård is great example of Art Nouveau architecture and was designed by Anton Rosen (who famously also designed the Palace Hotel in the centre of Copenhagen) and build between 1906 and 1914. 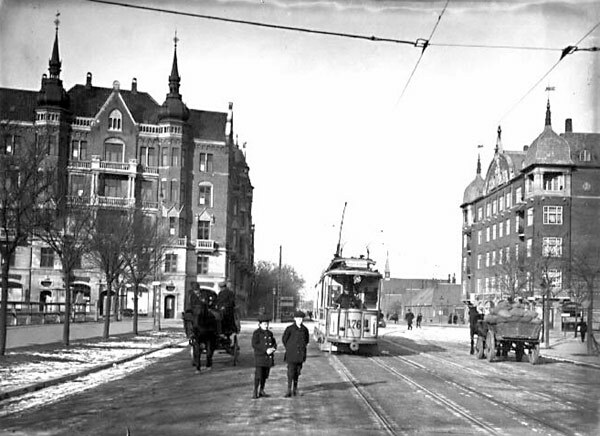 As you can see from these photos not a lot has changed, except the trams. 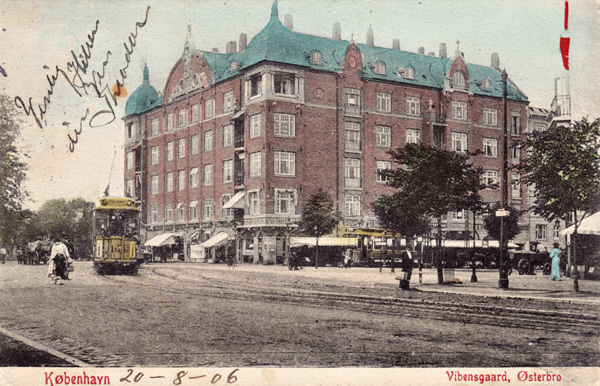 Next I looked into Lille Vibenshus on the opposite side of the street, where Østerbro pharmacy is now. 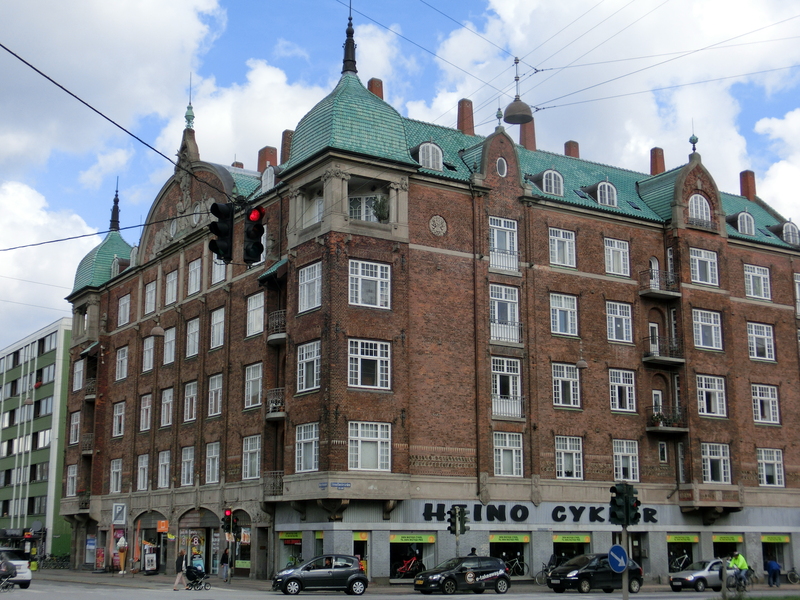 This was build at around the same time in 1907 and housed the first police guard in Østerbro. Finally the little hexagonal booth on the third corner was a telephone kiosk build in 1896 and was one of 30 build in the city. 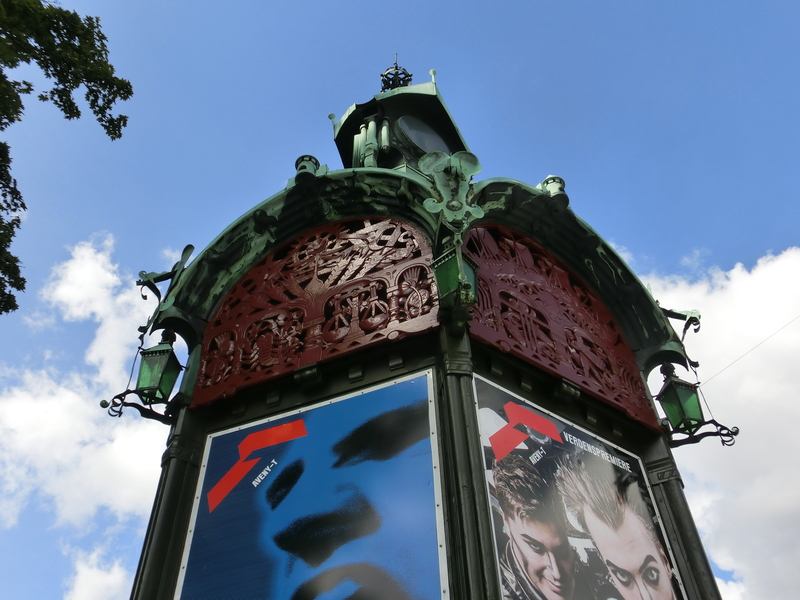 They were designed by Fritz Koch and housed the first pay phones. Some still still remain but none are used for their original purpose. Inside there was a telephone and writing desk and the outside would have been used for advertising, just like today. Sadly I couldn’t find any old picture of this but it looks exactly the same I am sure. I loved finding out a bit more about the history of places I see everyday and there are plenty more to investigate around here. I hope you enjoyed this little glimpse into the past. I took almost exactly the same photos of those buildings last week! Thank you for the background to them, it’s always interesting to find out how neighbourhoods change and develop over time, a shame the trams have gone though! There are loads of interesting buildings around this area, I think I may pick a few others to feature soon. I would love there to be trams – they would be a lot quieter than the buses!